Too many of us live our lives in fear of failing. While some have a fear of flying, I think that once you’ve been through some great successes you no longer fear doing too well. The goal becomes to also be okay with the opposite – failure. Anyone who is driven and wants to succeed must come up against this. It’s easy to stay in the known and optimize towards a 3-4% better conversion rate, but what happens when you want to 10x your business in the next few months? You won’t get there by doing tiny changes that get you .25% better (unless you are building off a huge base already). You have to change your mindset. I’ve been running Credo fulltime for 8 months now. As the number of leads has increased well, revenue increased then went flat for months (the numbers below are a few months old). Start dealing with higher budget leads, which even if they close at a much lower margin have a higher value. The high budget leads space is already crowded, whereas the SMB space is very diverse and spread out. Agencies feel like the current places they get leads from that charge 10% of the lifetime of the project are too expensive. Raising prices would not be the way to go. This one had a few different ways I could do it. Once I realized that I didn’t want to start dealing with super high budget leads and didn’t feel right charging 10% of the lifetime of each project, I knew I needed to find a new business model. While everyone on Credo enjoyed the 10% of the first 3 months (or 10% of a one-off project), it was too good to be true for the longevity of my business. Essentially, Credo was bearing all of the risk. If a lead closed then Credo made money, which was always a good feeling. However, if a lead did not close then Credo (aka me) had done a lot of work for zero reward. If I passed a lead to someone who was then contacted by that lead’s competitor with a higher budget, and therefore they chose to pursue that lead instead of mine, that was great for their business but terrible for mine. 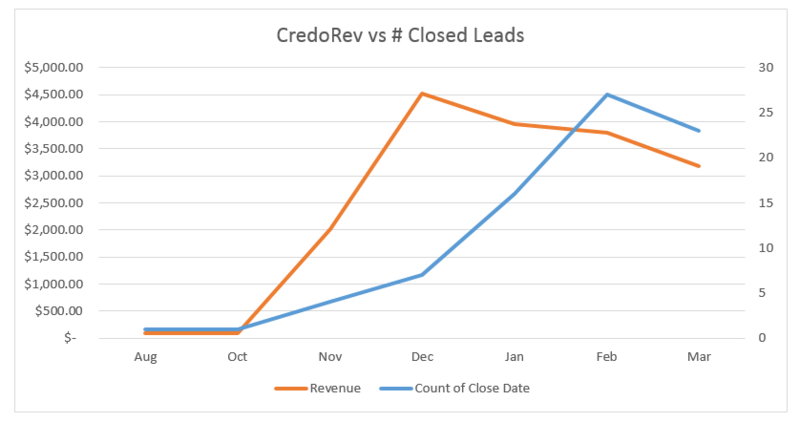 As shown in the graph above, the number of closed leads was increasing every month but revenue went flat. Even more than this, I was also being emailed by pros (who thankfully are full of integrity) that leads had found them because of their Credo profile and the pro wanted me to get credit for it. This was a lightbulb moment. Credo isn’t just a lead generation engine; Credo is a marketing channel for agencies and consultants. 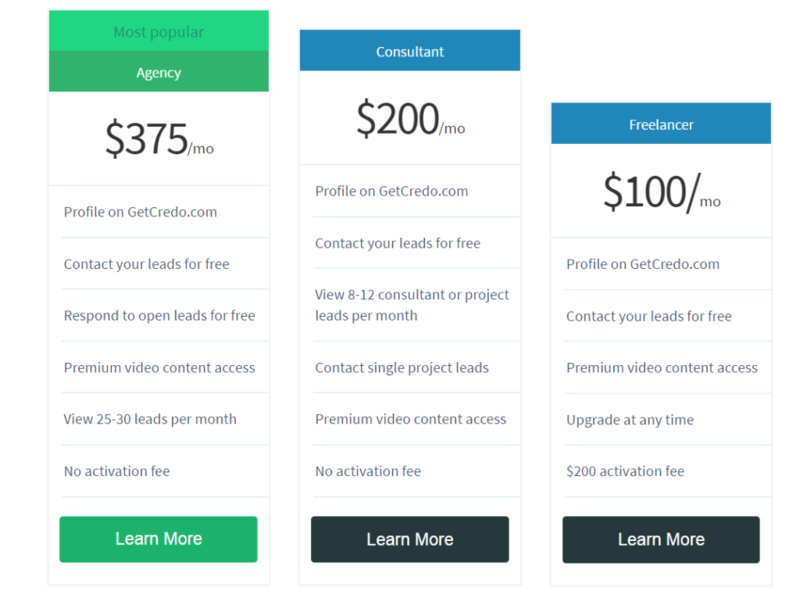 I built out the first one and after user feedback realized that pros would feel nickel and dimed if they had to pay for each lead. Instead, they said that they would be much more willing to have a monthly membership with access to leads, their profile, and premium content (video and otherwise). At the size of most marketing leads, just one or two signed per year will give a pro a 10x return on their spend. That is huge. So Where Is The Fail? I’ve never run a SaaS business before. I’ve read a ton about it, to be sure, and feel like I have a very good knowledge of the challenges I may face. However, like all business pivots, I have no clue if this is going to work. I have no clue if people will sign up and pay my company dollars every month to grow their business. I know a large chunk of the existing pros will stick around, but will new ones sign up? This thing could go either way. Either I’ll be sitting on a much more valuable company that continues to grow the businesses of those listed or I’ll have to change the model again to see if something works better. I know that either way I’ll have to keep iterating and building and moving as the market needs it. Am I afraid of failure? Just like anyone, of course. But. I am infinitely more afraid of just continuing on in a limbo of something that is kind of working but not necessarily succeeding the way I want it to. I’d love for you to go check out the new Credo and show your support however you can! GravityView is Major WordPress ? What a great journey you are on, thanks for sharing so candidly. Speaking as a small consultant, the way I evaluate your offer is two sided – how many people are going to see me ( and what type of traffic is it- how ready to buy) and who am I competing with ( and how is that displayed to give me a chance to win). Unlike most other lead gen sites that I am used to, your knows no geographic boundaries, so it may seem like you are fighting everyone. Looking forward to you changing the game – our prospective clients deserve a better way to find consultants they can trust and who earn their income honestly while providing great value. Thank you for this comment and for the support! I definitely need to make it more obvious around how many people might see you and who you are competing against. I wouldn’t say that Credo doesn’t have geographic boundaries. I am actually looking right now into how I build out pages based on location. So these are coming! I’d love for you to give Credo a shot even on the Freelancer level!